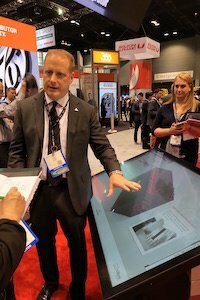 Chad Uplinger, vice-president Motive Power Americas at EnerSys demonstrates the battery management system at ProMat. CHICAGO – EnerSys introduced its new NexSys iON and NexSys PURE batteries at a ProMat press conference. The advanced Lithium-ion (Li-ion) and Thin Plate Pure Lead (TPPL) solutions are engineered to deliver simply superior power for a wide range of material handling applications. 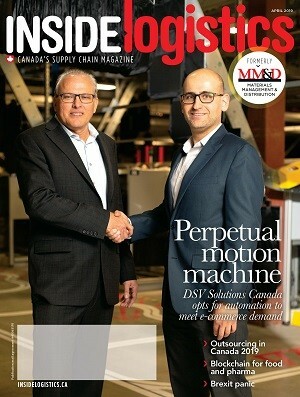 “EnerSys has continuously been at the forefront in offering power solutions to improve the overall customer experience, and today, with the launch of these two advanced power solutions, we’re continuing on that path of commitment,” said Harold Vanasse, senior director of marketing, motive power Americas at EnerSys. NexSys iON batteries are built to the highest safety, design and manufacturing standards to power material handling vehicles. It is offered in multiple sizes and configurations and integrated with a battery management system. The iON batteries are engineered with large format prismatic cells and top-of-the-line Nickel Manganese Cobalt (NMC) cell chemistry. The integrated Battery Management System (BMS) in the control module provides protection, control and communication to the charger and truck. NexSys PURE batteries, designed with TPPL technology, provide reliable power without the restrictive requirements of watering, equalizing and battery changing tied to conventional lead acid batteries. Equipped with an advanced BMS, charge and thermal controls are managed and the Wi-iQ battery monitoring device provides a continuous wireless data stream and stores all information and history of the battery.